Capone's Dinner & Show Loves Their Fans! Capone's Dinner & Show is thankful for all of our fans on Facebook. Some of their posts on our wall are so enjoyable, we'd like to share them with our internet visitors that do not have access to Facebook. Whether they are at their office and not allowed to log onto their account, or just don't want to have a Facebook account, now everyone can read our extra special posts from our fans here on our web site! Listed below are links to our special fans stories. To read ALL of our fans? posts, please join us on Facebook! Upload a dinner show photo from YOUR experience on Capone's FB wall and YOUR post may become a story link on our site! You may also send us your photo and comments by using our photo/review form. To visit ALL of our fans posts, or to post photos from YOUR visit to Capone's, please join us on Facebook and add yourself to our fan list! 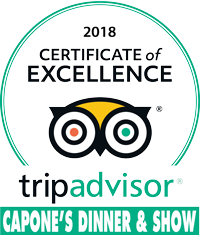 If you would like to submit a comment about an Orlando dinner show or a review about Capone's Dinner & Show, contact Big Al. We love to receive feedback about our show and delicious dinner buffet. You may also send us an E-mail or call one of our wise guys on the telephone.